The Boleyn Workshop is heated by an ex-railway waiting room stove from West Dean station in Wiltshire. It was given to me by friends who owned the old station house once upon a time. 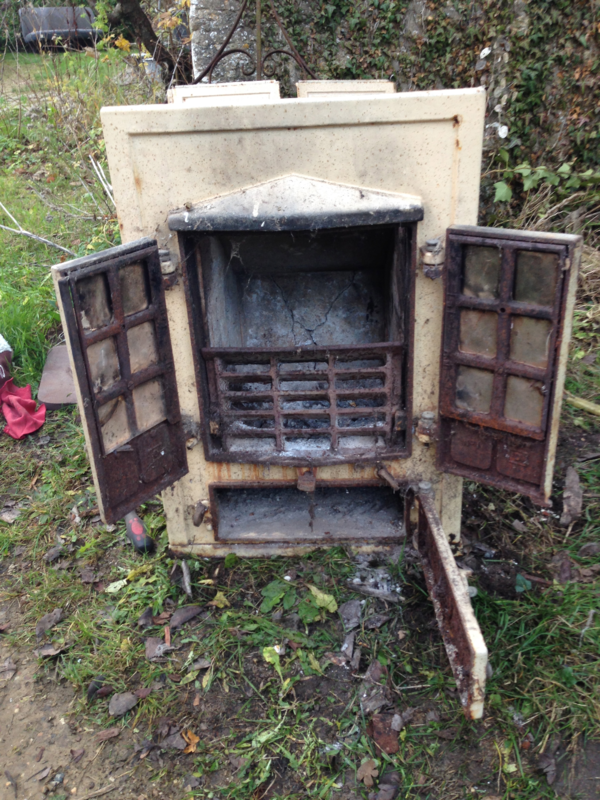 They found the stove abandoned in a semi derelict outbuilding and kindly donated it to the Boleyn Workshop. It is a cracking little stove, burns anything and doesn't half chuck out the heat after a short while. However...due to the period of time it had spent exposed to the elements it had some internal damage which led to smoke billowing out from the top when starting up. So after about ten years of putting up with it I eventually decided that something ought to be done about it. Two years ago we opened up a fireplace in the house and hired a chimney sweep to fit a bird cowl on to the new chimney pot. I was chatting to the chap about the stove when he brought up the subject of a repair medium that could be applied via a mastick gun. It sounded so good to me that I bought a tube and immediately let it sit on top of the workshop tv until last week when I noticed it again. I was so concerned it had solidified in the tube and been a waste of £4.50 that I immediately dragged the stove out off its plinth for inspection. It was time for action. Above: So there it is in all its dusty glory. I do admire the proportions of this 1930s gem. Below: Rear view. The top section sits without any fixings and is simple to remove. Below: The right hand panel is removed easily, two holding screws and a single bolt. Below: The LH panel with inscription. Below: The top section of the stove is held on by a bolt on each side. Below: You can see the damage caused by years of expansion and contraction and rainwater. Below: a close up of one of the two bolts up inside the stove that holds the cover plate on. In true Boleyn Workshop style I forgot that it was unnecessary to undo these two cover plate bolts from up inside the stove as once the lid bolts are undone, the entire top section lifts off. So I spent some time with one arm stuck up the flue pipe with a spanner in my hand before I realized, just like the first time I stripped it. Below: The top section is cracked in to two pieces and the cover plate has a section around the bolt hole split off. However I will be able to create a smoke proof seal with the mastick when they are bolted down tight. Below: Here you can see the damage to the firebricks that needs repairing. Not the gap in the middle,that is a vent! Below: Here is the finished repair. The gaps in the firebricks were filled up and smoothed off. Next I put a line of the fireproof mastick around the top lip of the stove walls before laying the top section back in place. Then the cover plate had the same treatment before being bolted down again. Below: The magic stuff itself in a blatant advert for the manufacturers. Watch this space to see if I am still smoked out the next time I spark it up. I got an email from an Apollo owner who found my site on the internet after thinking he probably had the only one. He says they are similar down to the crack in the top plate. Hopefully once restored there will be another photo. Thanks Tom. Update: I was recently contacted by the present owner of the Station House in West Dean whose maternal grandfather was the stationmaster there in the 1930s. Up until now he had had no success researching any information on this interesting family connection and sadly after speaking to me he was no better off. But it's a small world.